ZIMBABWE – When it comes to blueprints and acronyms, Zimbabwe does not have a shortage in that department. BUILD is the latest in a production line in which predecessors and contemporaries include ZimAsset, ZimPrest, Restart, Juice, Hope, Sterp and a few more. It announces the long-anticipated arrival on the political stage of Joice Mujuru, not as a newcomer, for she knows the stage only too well having been there for 34 years, but as a newcomer in the proverbial trenches of the opposition. How time flies and with it, circumstances change! Barely a year ago, Joice Mujuru was the number two in Zanu PF, Zimbabwe’s ruling party. She was the Vice President of both party and country, destined, or so many thought, for the highest office in the land upon the departure of her then boss, President Mugabe, whenever he or nature decided to make a call on his long tenure as Head of State and Government. But then a political whirlwind summoned a force never before seen on the Zimbabwean political landscape, announced itself and swept Mujuru away, far away and deposited her on a political island, where she has remained marooned, gathering herself, until now. That hurricane, Hurricane Grace, is not yet gone – the eye of the storm is upon Zanu PF, the second column now seemingly imminent – but Mujuru has gathered and recovered herself, and stands at a safe distance from the hurricane and, from there, she has now made a re-appearance, bearing on her shoulders ladders, bricks and mortar, announcing her intention to BUILD and no doubt, inviting “Fellow Zimbabweans”, for that is how she addresses us, to join her in her proposed exercise. Ever the witty ones, some Zimbabweans are saying perhaps she should be asking us to help her RE-BUILD, a subtle reminder, no doubt, there was once something where she now proposes to BUILD and that she was part of the demolition team. Whichever way, Mujuru’s re-emergence has generated a mixture of excitement among her followers and cynicism among sceptics. Zimbabwe has a plethora of opposition leaders, all of whom claim to have parties. Not clear is whether all of them have any followers. Ordinary Zimbabweans have become used to and probably tired of announcements of new political parties. But Mujuru is a different proposition. Most people have anticipated since her ignominious departure from Zanu PF, that, at some point, she would launch a political party. That deed is not yet done but her manifesto, published in the media yesterday, tells the world that she is ready for the plunge. Her public rejection of her pension, a constitutional entitlement, last week gave us a hint that something was brewing. And so it is that now, she has to all intents and purposes, joined the race for the Presidency in the 2018 elections. My first reaction to her manifesto, when a colleague asked during a hectic morning when other pressing matters were exercising the mind, was that it was “short and colourful”. There is a lot of colour to it but then the colours of Zimbabwe’s flag have a particular brightness to them, which she compliments with a colourful dress. She even manages a smile. It’s a happy manifesto. It invites. But if there is nothing to it, as no doubt critics will say, the draftspersons deserve some credit for their achievement of brevity. Politicians are by nature of a talkative variety – they are those of whom elders say their mouths do not permit a fly to rest on their lips. It could have gone on for pages and pages, especially for a newcomer, as she bids to impress and distinguish herself. But it is commendably short and to the point. But then do manifestos matter in Zimbabwean politics? Some observers have long criticised Zimbabwean politics citing the ground that it is not policy-based, that there is less care for policy or the candidate than there is for the name of the party. This unflattering view of Zimbabwean politics was given reinforcement some years ago by an announcement by one former Vice President, the late Simon Muzenda, whom at an election rally while imploring supporters to vote for any candidate as long as he was Zanu PF, is said to have directed that even if Zanu PF were to field a baboon, they should still vote for it. In his universe, what mattered was the party and he was inviting his listeners into that universe. If it is true that policies stand for little in Zimbabwean politics, it might be said that Mujuru’s manifesto is of no relevance and efforts to analyse it would be condemned as an exercise in futility. While the view has some persuasive pull to it, nevertheless, Mujuru’s manifesto is worth studying, not because of what it says to the people but because of what it tells us of the author. Who is she? What does she believe in? What she think of us? In short, what does this manifesto tell us of its maker? This alone, is important, even if it were said its content will not make a difference in the decision-making process of the voter. It gives us a window into this woman who wants to lead and it is in this spirit that I have picked what I regard to be some salient points from the manifesto. The preamble is interesting not for what it says but what it does not say and here, as in the rest of the manifesto, there is an effort, perhaps a lot of effort, invested in trying to distinguish herself from Zanu PF. A Zanu PF preamble would have included a narrative of the liberation struggle at the outset. Yes, she talks about the liberation struggle later in her section on ideology and the summary at the end, but it is interesting that she does not make it her point of departure in her manifesto. Because she refers to it elsewhere, I do not think she is downgrading it, as her critics might want to say, but she is merely trying to distinguish herself by not making it her point of departure, as her old party would do. Her point of departure in the preamble is more about the future, it is more about building – in other words, it is aspirational. I guess that is the message she wants to communicate. She talks about Zimbabwe being “part of the global village” and locates it in the “geo-political context”. This language places her Zimbabwe in the world, and not just located in Africa. In line with her ideological reference to “market-driven policies”, clear preference for protection of “private property” and allusion to “address historical compulsory acquisition, through fair and transparent compensation”, Mujuru speaks to the notion of the “global citizen” influenced by market-friendly ideology. Mujuru leans towards privatisation of parastatals, reduction, if not removal of subsidies to parastatals, the “immediate establishment of value in land” and she talks about “guarantee of property rights, sanctity of contracts and other investor protection instruments”. As for her view of the role of the state in economic affairs? The state plays a role, she says, but only as a facilitator and regulator. Its “primary role” she says, “shall be to facilitate, promote, and regulate to ensure a level playing field in the economy with minimal direct State participation”. And she wants a “small but effective government structure”. So, what are we to make of Mujuru from all this? Her views are definitely market-friendly. She is amenable to capital, which probably makes sense when you are trying to attract investment in order to BUILD – the acronym for her blueprint. You cannot preach the gospel against the market and against property rights when you are trying to attract capital. But it is likely that this talk of “global citizenry” and market-friendly ideology will be seized upon by Zanu PF to accuse her of being influenced by the West and she will earn the label that Tsvangirai and others before her have been given by Zanu PF – the cruel and unfair label that she is a “Western puppet”. But the one aspect over which she will most likely be pilloried by Zanu PF is the reference in her manifesto to the issue of addressing “historical compulsory acquisition through fair and transparent compensation”. This will be read as coded language for protecting the interests of white farmers whose farms were compulsorily acquired without any compensation in the post-2000 period, a position which breaks the off-side rule in Zanu PF politics. Again this will be harnessed to cast her in the same light as Tsvangirai and other opposition leaders, whom they have always characterised as standing for the interests of white farmers. Mujuru must brace for that and be prepared for the onslaught. It is also notable that Mujuru taks about “all people” who call Zimbabwe“home” as having an entitlement to access land. This language is markedly different from that of Zanu PF which often talks about land and resources being only for “indigenous” Zimbabweans. Even in her preamble, Mujuru says Zimbabwe “belongs to all people who call it home, regardless of colour, creed, disability, gender, race or religious background” The message she is preaching is, “I don’t discriminate”. This is capped by her pledge for a “wholesale review of the Indigenisation Act”, which again goes counter to Zanu PF’s approach. It is obvious that the line against her will be that she is against the interests of the “indigenous” people; that she does not want them to benefit – the usual rhetoric that has been employed against Tsvangirai and others. Mujuru makes a special communication to three constituencies: the security sector, the traditional leaders and, indirectly, to veterans of the war. She states that she respects and recognises the role of the security sector in maintaining law, order, peace and security. But she also says they must be apolitical, well-resourced and will promote meritocracy and professionalism. Mujuru knows the critical role of the security sector in Zimbabwean politics and knows her fortunes may also depend on how the security establishment responds to her move. 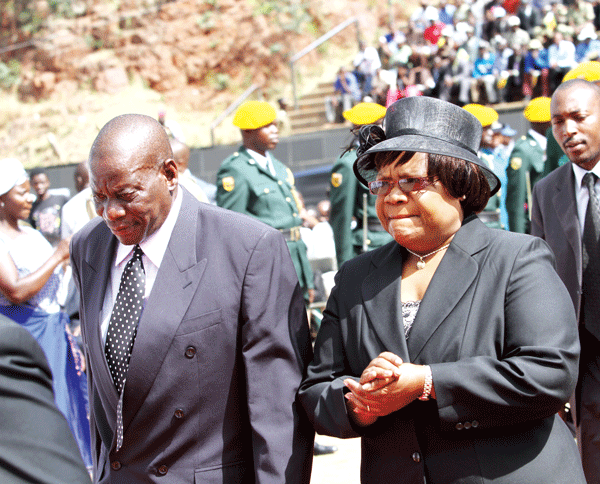 She is a veteran of the liberation struggle so no-one can accuse her of lacking in that department. But she is also making the same points that have been made by opposition politicians before – the need for an apolitical security sector. The message on meritocracy and professionalism appeals more to those in the lower ranks of the security establishment than the senior and more established ones. It gives the younger ones hope that they too can rise through the ranks on merit. She also talks to the traditional leaders, of who she says they will be restored – this can be seen as an appeal to them, that they will be looked after. Traditional leaders play an important role in electoral politics in the rural areas and it makes sense that she is giving them special mention in the manifesto. It is a message to say they are part of the equation, and will not be forgotten. What is evident, on analysis of the manifesto, is that the sound of the message is quite familiar. We have heard most of these things before, perhaps in different language, but the content on the critical aspects is not very different. Reading the points about the diaspora vote and dual citizenship – all this has been promised before by fellow opposition leaders. Different leaders are promising the same things, but they are not together. There is a convergence between what Mujuru is saying, even her policy-orientation, to what the MDC parties in their various guises have said before. And to be sure, the litmus test for this will be the reaction of Zanu PF and its commentators to her manifesto. The criticisms against her that will come from Zanu PF, will be a rehash of the same criticisms that we have heard before, only that there were directed at Tsvangirai and the MDC. She will be called a puppet, she will be described as representing white interests, she will be characterised as anti-black Zimbabweans – the whole lot. Perhaps that will help the opposition leaders that they have more in common that the aspects that divide them, and that if they truly wish to overcome Zanu PF, they are better together. Egos will have to go. It is understandable of course that Mujuru wants to build her base and show her own credentials. If she is successful in pulling people to her side, it will give her bargaining power in any potential coalition talks. While she will try to go with her supporters from Zanu PF, she has to remember that she will need to pull supporters from the existing opposition too. For that reason, she has to demonstrate how different she is from them. So far, her manifesto shows differences with Zanu PF but little difference with the other opposition. She will have to work hard to earn the support of the opposition supporters. But in order to woo them, she has to gain their trust. Opposition supporters are suspicious. You were in Zanu PF for 35 years, they say. If you had not been fired, would you have joined the opposition or remained part of the gravy train? Why don’t you acknowledge wrongs of the past, not just failure of economic governance as you did in June but also the atrocities that took place in 2008 and in the 1980s in Matabeleland when you were part of the establishment? These are not my questions. These are questions that people are asking and they are legitimate enquiries whose vote Mujuru must earn. Politicians don’t often do apologies but it will serve her well to show contrition for wrongs of the past, committed by a government in which she was a key member. It won’t hurt her, if anything, it will enhance her estimation in the eyes of ordinary people. The manifesto talks about “compassionate national and spiritual healing programmes throughout the country addressing trauma emanating from pre and post-Independence conflicts in Zimbabwe”. All well and good, but what the ordinary people need for starters is are simple words: sorry, we messed up. But politicians don’t get this simple message. Her idea of expert advisers for the Presidency is commendable. Zimbabwe has talent spread across the globe. The Zimbabwean Presidency doesn’t need foreign advisers when it has its own talent. They know Zimbabwe better and will probably do a better job, serving Zimbabwe’s not foreign interests. Do manifestos matter in Zimbabwean politics? Probably not. Do manifestos affect voters’ opinions in Zimbabwean politics? Probably not. But they can help us to understand a newcomer. They help us craft questions that we can put to them in order that we understand them better. Mujuru’s manifesto is a boon for critical and incisive journalists. There is so much more to ask from what she has given us in this short and colourful manifesto. Meanwhile, I wish her luck. Knowing Zimbabwean politics, she will need it.